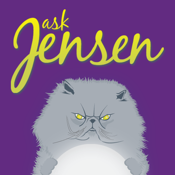 Download our FREE version of the Ask Jensen app. Although the number of predictions are limited, you could always purchase the complete version of the app should you want more precise and accurate readings. Ask Jensen is a simple to use iPhone application. All you need to do is either shake your phone, or click the Ask Jensen button, to activate little Jensen’s psychic ability and receive a prediction. This version focuses on these main areas: FREE version (limited predictions). Although Ask Jensen is sold as a novelty divination tool, we encourage owners to write down their predictions and check back to see just how accurate little Jensen’s divinations can be. Predictions may not unfold the way you envision them unfolding, but the essence of the prediction is surprisingly accurate. See for yourself. Take three deep breaths, and when you are in a relaxed state, focus on your question and then shake your phone to receive a prediction from Jensen. Repeat as desired. Jensen would also like to extend his heartfelt thanks to you for downloading the Ask Jensen: Free Version application. And he encourages you to purchase one of his apps because this psychic blue-grey Persian intends on using proceeds towards adding more ‘servants’ to his staff so that he can develop and deploy more divination tools.